There were 298 press releases posted in the last 24 hours and 153,383 in the last 365 days. 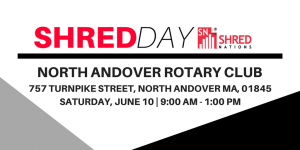 NORTH ANDOVER, MA, US, May 31, 2017 /EINPresswire.com/ -- The North Andover Rotary Club, in partnership with Shred Nations, will be hosting a shred day for North Andover community residents to shred their confidential documents securely on Saturday, June 10, 2017 from 9:00 AM to 1:00 PM at 757 Turnpike Street, North Andover, MA, 01845 in the Stop and Shop parking lot. The Shred Day will occur rain or shine.